high-dimensional phenotypic readout of these perturbations (e.g. gene expression or morphological profiles). 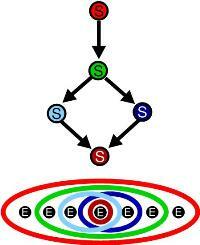 The output is a directed graph representing the phenotypic hierarchy. The package contains an example dataset on Drosophila immune response and a vignette explaining its application. You can download the newest release from the package's Bioconductor page. A. Tresch, F. Markowetz. Statistical Applications in Genetics and Molecular Biology: Vol.7: Iss.1, Article 9, 2008. F. Markowetz, D. Kostka, O.G. Troyanskaya, R. Spang. H. Froehlich, M. Fellmann, H. Sueltmann, A. Poustka, T. Beissbarth.